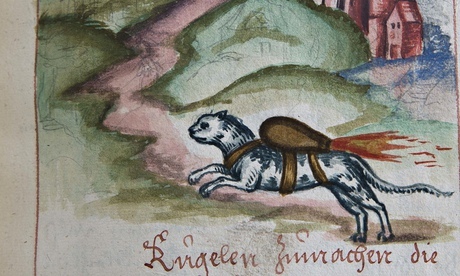 Just the latest evidence that the Internet was invented centuries ago: recently-discovered pictures of 16th-century German warrior cats with jetpacks. Unfortunately for the animals, these were also kamikaze cats, or they would have been if the Germans gave them Japanese names, which as far as we know they didn’t. Written entertainment for the digital age. Enter your email address to follow this blog and receive notifications of new posts by email - including the Semi-Literary Trivia Question of the Week!